Join us for our FREE family-friendly Heritage Days! 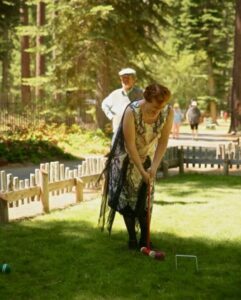 Explore what life would have been like visiting Lake Tahoe in the 1920s at our summer estates. Take a self-guided tour, play historic games like croquet, sack races, tug-o-war, educational kids activities throughout the site, relax by the shore, spend the day! Drop-in fun, ‘Nanny-guided’ creative activities for young children and families throughout the day at the Artist’s Cabin – Wednesdays and Saturdays at 11am, 1pm and 2pm. Most crafts and activities take approximately 30 minutes to complete. Some supplies and materials are available, others may require a scavenger hunt along the shoreline or forest! Visit the Museum and Gift Store; look in the outbuildings that staff lived in laundry, nanny, gardener and more! Have a family picnic on the beach, read a book on the porch of the Indian Cabin, bring your morning coffee with you and enjoy sitting on one of the many benches available along the shoreline. Take a walk on the promenade (we’ll show you the way) where the Tallac Casino and Resort once attracted wealthy San Francisco area families to the area, interpretive signage and foundations depict a bygone era that Lake Tahoe once represented!